Man’s best friend might act high and mighty, but every pooch needs a little help when it comes to staying neat and tidy. Dogs turn into frolicking toddlers when they come across a mud puddle, a patch of freshly mowed grass or even an open trash can. No wonder they start to smell a bit less than pleasant! That’s when you know it’s time to bathe your dog. But how often should you wash your dog to prevent the build-up of bacteria, dirt, insects and all the other grime you’d rather not have on your sofa or bed? The answer isn’t clear cut. It truly depends upon a number of factors, consider the following questions when deciding if it’s time to wash your dog. Consideration #1: Where Does Your Dog Spend Most of His Time? Do you have a pet who would rather hang out and watch television than go for long walks throughout the neighborhood? Or is your furry friend ready to get rowdy outside any time, any season? Most indoor dogs probably won’t get nearly as greasy or stinky as outside ones, which means you can expect to wash them at least once a month. On the other hand, a very active, outdoorsy doggy might require a bath every week. Consideration #2: What Kind of Coat Does Your Dog Have? Some dogs have a stiff coat or a double-coat. These types of coats help them resist the build-up of dirt. In fact, you might be able to brush out a lot of debris without trouble. On the flip side, pooches with super-soft coats or short hair tend to get dirtier faster. Their coats simply don’t have the resistance to bacterial and particulate build-up. At that point, you will need to wash your dog. Consideration #3: Does Your Dog or Someone in Your Household Have Allergies? While you don’t want to overdo it with baths because they can be drying to dogs’ sensitive skin, a dog with allergies may need baths more frequently than a dog without. At the same time, if you or someone else in your home has an allergy to your dog, the dog should be bathed as frequently as each week. Remember that if you’re planning to bathe a dog every seven days, you should opt for an organic doggy shampoo for maximum comfort and outcome. People shampoos are not healthy for a pup’s skin. Consideration #4: Does Your Dog Have Fleas? A dog with a flea infestation should be treated immediately with medication and a flea dip bath. However, flea shampoos are notoriously harsh on a pooch’s skin. Therefore, be certain you don’t try to give your dog with fleas a bath every day. Once a week should be enough. If you are uncertain, contact a trusted veterinarian. Consideration #5: How Does Your Dog Feel About Baths? Did you begin a bathing routine with your dog early in his life? For instance, did you bathe your puppy often enough to get him accustomed to the experience? Some dogs adore having a bath, while others shake, howl and generally loathe bath time. 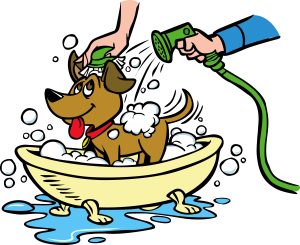 Bath time may be a more pleasant experience if you take your pet to a self-serve pet wash. Discover pet-wash station near you. No matter how frequently Fido, Spot or Fifi gets a bath, make sure it happens. Both you and your best friend will be much happier!